Following another round of in-store display leaks that GoPro just can’t seem to avoid, the action cam maker officially announced today a new 7-series line featuring three compact cameras differentiated by scaling features, but now easily distinguished by black, silver, and white housings. At the top end of the line is the $399 GoPro Hero 7 Black, but you’re going to have to look really hard to see what’s new versus its predecessor, the Hero6 Black. The Hero 7 uses the same 12-megapixel sensor, has the same custom GP1 processor (with a small bump in RAM), and offers the same capture capabilities: 4K video at 60-frames per second, 2K at 120-frames per second, and hi-def 1080P at 240-frames per second if you’re after an extremely slow motion effect. It’s still waterproof to a depth of 10 meters, can livestream footage, and offers GPS location tracking, but the real reason GoPro thinks you’ll upgrade to the Hero 7 Black is a feature it’s calling “HyperSmooth stabilization,” which the company says will work as well as a mechanical hardware gimbal when it comes to smoothing out footage captured when running, riding a bike, or other activities where you’re bouncing around. But it’s still software stabilization, meaning data from a built-in gyro is being used to digitally cancel out any jarring motions, which in turn means your footage is going to get cropped. The sample footage GoPro shared on its YouTube account this morning looks polished enough—undoubtedly the new software in the Hero 7 does a slightly better job at smoothing motion and vibrations than the Hero6 can—but it’s still no replacement for mechanical image stabilization where the actual sensor is being adjusted and repositioned to cancel out unwanted movements. Stepping down from the Hero 7 Black are the $299 Hero 7 Silver and the $199 Hero 7 White. Those price cuts cost you the fancy GP1 sensor and the Black version’s HyperSmooth stabilization. They also include a smaller 10-megapixel sensor and reduced capture capabilities. The Hero 7 Silver maxes out 4K at 30-frames per second, while the GPS-less Hero 7 White can only hit 1440P at 60-frames per second. You might also notice that neither camera comes with the Hero 7 Black’s front-facing status LCD screen, making it a little trickier to ensure you’re capturing your reactions during whatever extreme stunt you’re trying. 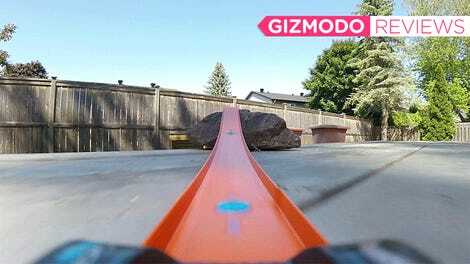 It’s no secret that GoPro has been having a tough time as of late. The now-dead Karma drone was a disaster, resulting in the company having to layoff 200 to 300 employees in January. And soon after that, it was rumored that CEO Nick Woodman was possibly looking to sell the company, or for a partnership, to help keep it afloat. 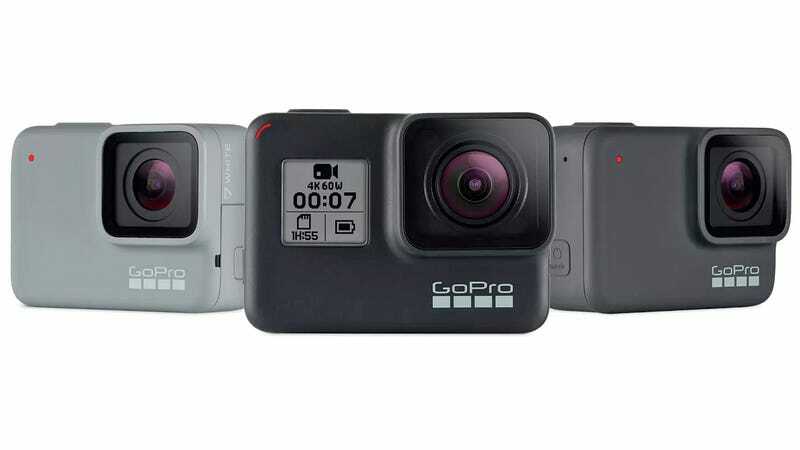 The new GoPro Hero 7 line is obviously an attempt by the company to streamline its product offerings; along with today’s announcements, GoPro revealed that its tiny, cube-shaped Session camera was being phased out as well. But is it enough? GoPro’s biggest problem is that its new hardware has always been incremental updates to existing cameras—giving little reason for its customer base to immediately upgrade. The new stabilization improvements are certainly enticing if you’re in the market for your first action camera, but for existing users, there’s not exactly a compelling reason to immediately ditch the Hero6 when the 7 line goes on sale next Thursday.